You notice it right away if your toilet bowl is in need of cleaning, but the tank is a different story. Unless you lift the lid and peer inside, you won't see the rust rings, scale and bacterial growth that affect every tank, given enough time. You might be satisfied with an "out of sight is out of mind" approach, but you shouldn't be. Rust and scale can affect the operation of the toilet, and bacteria and algae can produce odorous water that ends up in the bowl after every flush. When the water takes on an unhealthy-looking yellowish tinge, bowl stains aren't far off. 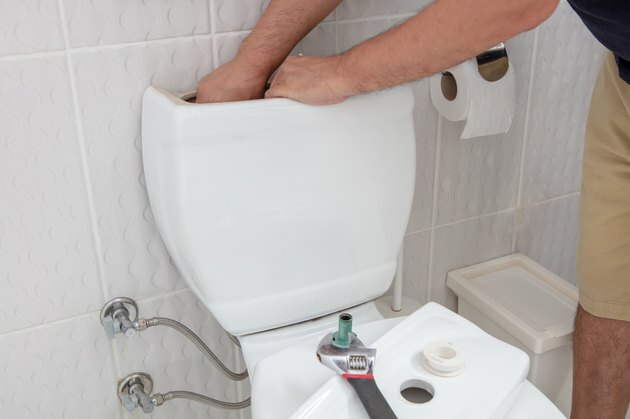 Keeping your toilet tank clean can be one of the easiest of home maintenance jobs. You can usually kill all the nasty bugs and remove most stains and deposits simply by pouring the right chemical in the tank and letting it sit for a while before flushing. But before you get to the point at which this easy procedure is effective, you might have to drain the tank and do a deep clean. Doing a deep clean may call for a little disassembly. If it's been a while since you cleaned your toilet tank, and you have hard water, the flush and fill valves are probably just as dirty as the sides of the tank. While you don't have to remove these valves to clean them, you should disconnect the chain from the flapper, remove the flapper, and unscrew and remove the float ball if your toilet is equipped with one. That will give you more space to work and it will allow you to clean these parts in the sink. Turn off the water supply and flush. Hold down the handle until no more water spills out of the siphon hole in the bottom of the tank. Remove the rest of the water by using a sponge to transfer it to the toilet bowl. Spray the sides of the tank and the fill and flush valve tubes with a disinfecting bathroom cleaner that contains bleach. This procedure won't remove stains, but it will kill all the odor-causing bacteria. If you don't like the idea of using bleach, add a cup of vinegar to a cup of water and add two or three drops of dish soap. Vinegar disinfects and deodorizes almost as well as bleach. If you need a more abrasive cleaner, make a paste using borax, vinegar, water and dish soap. Scrub down any parts of the mechanism that you can remove, including the ball float (if so equipped), flapper or canister and the flush handle armature in the sink, using the same cleaning solution you use for the tank. Re-install these parts after rinsing them well with clean water. Turn on the water and let the tank refill. While the water is running, pour in a quart of white vinegar. Let the solution sit in the tank for several hours or overnight before using the toilet. The vinegar will dissolve hard water deposits, mineral stains and will kill any bacteria you missed when scrubbing. Flush and add more vinegar if any stains are still present after the soaking period. 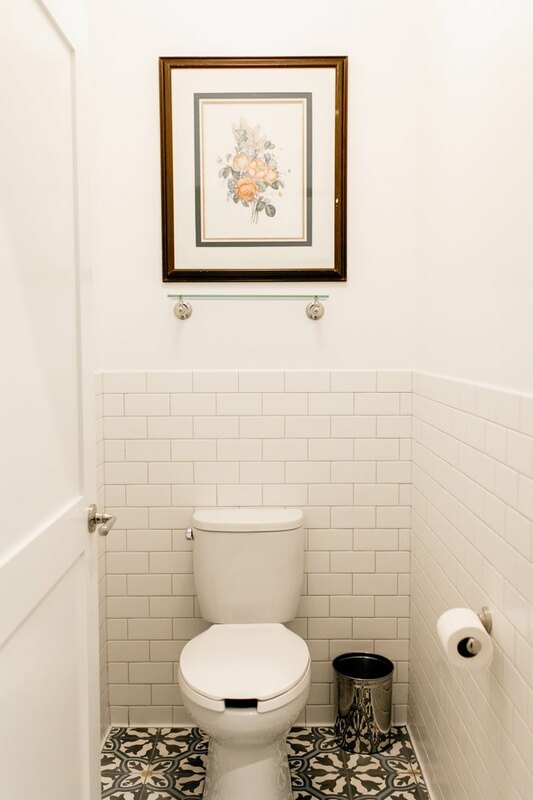 Vinegar is a strong acid that can handle most mineral stains, but some toilets, such as the one in the basement that everyone is afraid to use, need extra help. Muriatic acid, which is available at any hardware store, will dissolve the stains that vinegar can't, but it's significantly more dangerous to use. You should always wear gloves and goggles and keep the bathroom well ventilated. Pour about a cup in the tank only after the tank is almost full of water—never when the tank is empty—and wait overnight. Don't flush this strong acid into the waste pipes, where it can do all sorts of damage. Instead, after it has done its job, remove it from the tank with a siphon pump or turkey baster and dispose of as hazardous waste. Keeping the Tank Clean—Should I Use Blue Disinfectant? It's actually fairly easy to keep the tank clean after you've scrubbed it down. Pour a quart of vinegar in the water every few months and let it soak for a few hours before flushing, and it will keep stains and bacteria at bay. You can buy tablets to drop in the tank to keep the water disinfected, but there are several good reasons to not use them. The tablets contain bleach, which degrades the seals on the flush and fill valves. This can cause slow leaks. Bleach ends up in the plumbing system and is particularly bad for septic tanks because it kills beneficial microorganisms that promote waste decomposition. Bleach and other disinfectants are also harmful to dogs that drink from the toilet, despite assurances on the label that the product is "pet-safe." The tablets don't control mineral stains, and because they color the water, you might not notice the stains until they are well advanced and more difficult to remove. The blue colorant stains your hands whenever you have to reach into the tank to adjust the fill or flush valve, and it can stain your clothes.